Greenwood Cemetery, New Bern, NC. 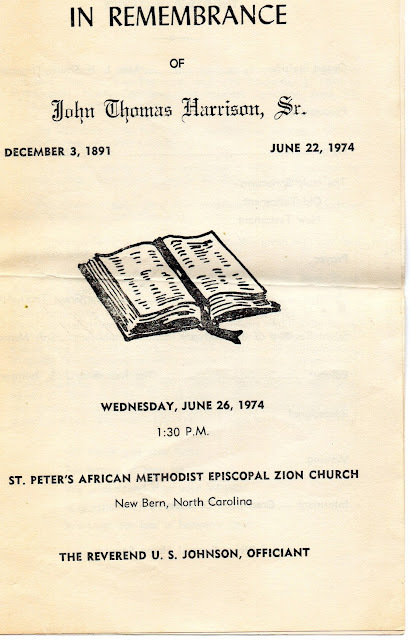 A very special gathering took place this past Saturday afternoon that I was blessed to have had the chance to attend. In light of this, I thought it would be good to re-post some of the things that I know about my great grandfather grandfather John Thomas Harrison Sr. I will share details about this special happening in an upcoming blog post. 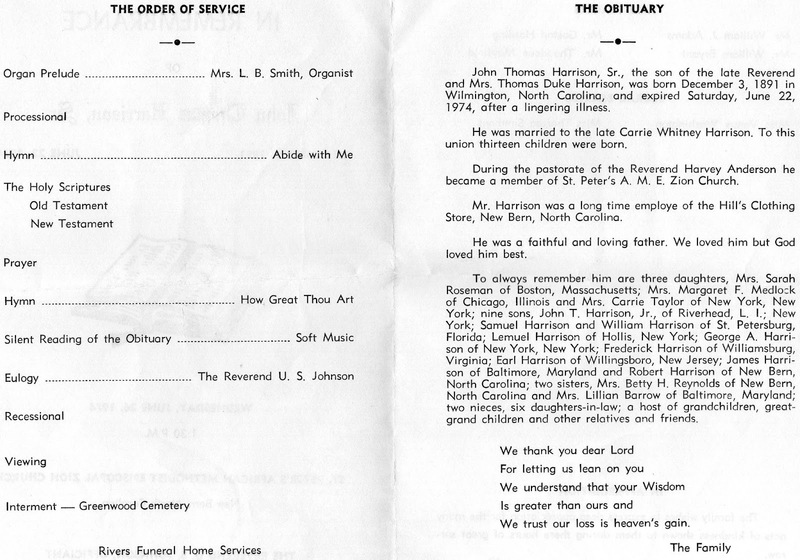 My great grand father John Thomas Harrison Sr., was a tailor until he passed away in 1974. 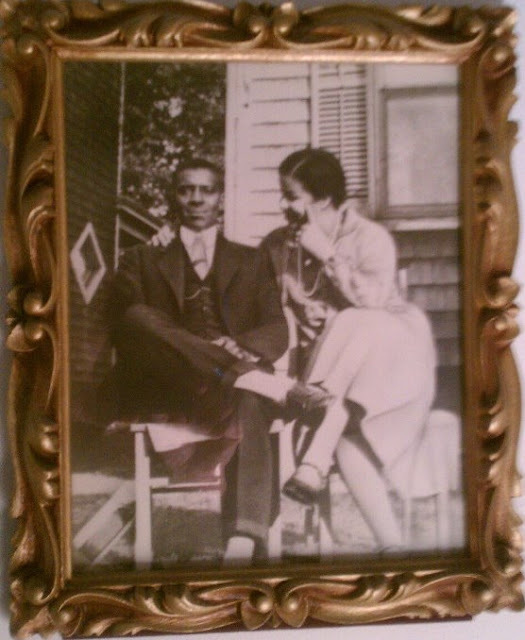 He had worked most of his life for Hill Tailoring Co. in New Bern. I was able to pull up an article online regarding the place he worked at. It is from "The Illustrated City of New Bern, North Carolina, 1914." HILL TAILORING COMPANY.—Makers of clothes that gentlemen wear. Among the high class tailoring house of this city, that of the Hill Tailoring Company is worthy of prominent mention. The location of the concern is in the heart of the city at 79 Middle Street, with phone 740. Mr. H. M. Hill is the proprietor. He is one of the city’s well known business men and stands among the very leaders in the tailoring trade. He carries an immense stock of high-class suitings and turns out the most fashionable and perfect fitting garments at reasonable prices. This business has been established for three years, and keeps steadily growing in volume. Before he was a tailor, he had a connection to Pepsi. Well, a lot of people from New Bern have a connection to Pepsi, since it is the birthplace of Pepsi Cola. 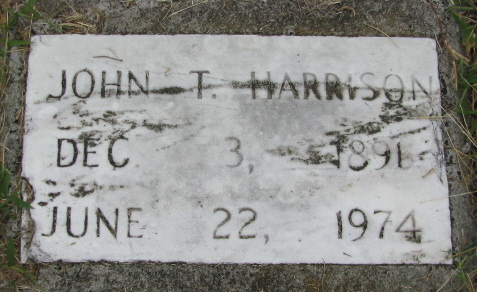 John Harrison was a porter at one of the Bradham's Drug Co. locations in New Bern according to the 1916 "Official Directory of the City of New Bern" published by Chas. S. Gardiner. I think if he were alive today we might have to have a discussion about the age old battle of "Coke vs Pepsi", because I prefer Coca Cola. Nah...We probably would have a talk about a few other things first. *Portions of this post originally appeared here on this blog on July 12, 2011 , July 13, 2011, and July 26, 2011. I think you'd talk about plenty before you got around to pepsi vs coke. LOL.